When it comes to booking accommodation, people often underestimate how early they have to book. In Graaff-Reinet, guests often book their accommodation months in advance, to ensure they get the best lodging possible. Graaff-Reinet is a very popular town for various reasons. As it is halfway between Gauteng and Cape Town, it is an ideal stopover for travellers. Graaff-Reinet hosts a variety of events like the Karoo Stoep Wine Tasting weekend in May, school reunions in August, the KarooRus festival in September, and a variety of sporting activities that take place throughout the year. Other activities include hiking, fishing, hunting, and fossil hunting to name a few. According to guests, Graaff-Reinet is one of the best small towns in South Africa and is a wonderful place to choose when planning your next trip. With all there is to see and do, there will never be a dull moment. With most of the key events, accommodation is booked out months in advance. December is the busiest time on any guest house calendar and bookings are made up to a year beforehand, which means you will struggle to find last-minute accommodation. Not only will booking earlier guarantee that you get the best accommodation, but it can often save you money. By booking early, some guest houses will offer you the previous year’s rates, or even give you a discount for your early booking. Some guest houses and hotels increase their accommodation costs over the peak seasons like school holidays and summer, but will also lower the price in the off season. Even if you are not price sensitive, finding suitable accommodation in Graaff-Reinet during peak periods will always be a challenge. You might still find accommodation, but the quality will not be what you want or expect. The best accommodation is always snapped up early, so last-minute availability could indicate the fact that no one else was willing to spend the night there. Booking before you arrive can guarantees you get the best accommodation. Even though there are a lot of different accommodation options available in Graaff-Reinet, one name stands out above the rest. KarooRus is a self-catering guest house, with seven fully equipped units, each with a private bathroom and fully equipped kitchen. With top-quality bedding and crisp linin, sleeping over is a luxurious experience. There is a private entry to each unit and also safe parking. KarooRus is child-friendly, and also caters for the handicapped. We are also pet friendly, and baby baths and camping cots can be provided if requested. We also provide braais and wood. KarooRus is known for its modern comforts, combined with old-fashion charm. Each unit is equipped with DStv, air-conditioning, electric blankets, and uncapped Wi-Fi. 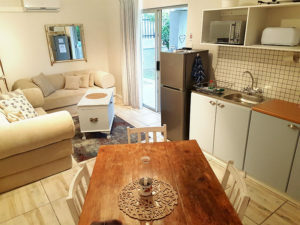 KarooRus is also located in the heart of Graaff-Reinet, and is an easy walk or quick drive from most attractions, activities, restaurants, and shops. To book your next comfortable and luxurious accommodation in the heart of Graaff-Reinet, contact our team today. Better early than in a hurry.